As AOL prepares for the next decade free of Time Warner, the BBC's technology correspondent Rory Cellan-Jones looks back on the merger that was meant to change the world. Was there ever a deal like the one which saw AOL merge with Time Warner in January 2000? AOL was the best-known name on the internet - who'd heard of Google then? - while Time Warner controlled a sprawling empire of magazines, music, movie and television businesses. Together they would form, in the words of their press release: "The world's first fully integrated media and communications company for the internet century." 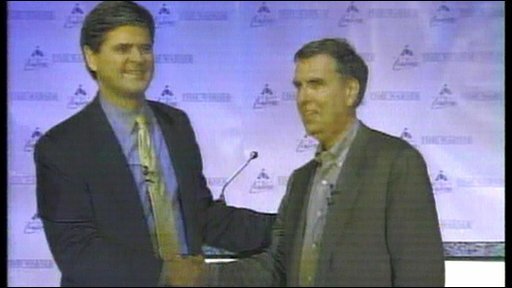 And while it was billed as a merger of equals, Steve Case of AOL - in a tie for once - was evidently the senior partner as he embraced Time Warner's chairman, a tieless Gerald Levin, before crowds of excited reporters. Those journalists were in no doubt - this was not just a huge business story, it marked a sea-change in the way the world worked. A glance at the story on the BBC's website gives a flavour of the mood. One reporter is quoted as saying "it will reinvent television and the possibilities are endless". Another proclaimed that "putting these two companies together means huge gains for both", and a third, one Rory Cellan-Jones, said: "Shockwaves from the merger are already being felt around the business world." Even that venerable BBC voice Alistair Cooke pondered the meaning of the merger in his Letter from America, mocking the jargon used to describe the deal's importance and wondering whether it really meant "The death of the old media", as the newspapers seemed to think. A decade on, it's hard to recapture the febrile atmosphere of those times. Quite suddenly, young internet companies run by twenty-something entrepreneurs were apparently worth billions, despite having little or no revenue. Anyone with any ambition was leaving their job in a bank, an accountancy firm or a newspaper to be part of the dotcom revolution. And amateur investors sat for days in front of their computers trading in the shares of the dotcoms and urging everyone else to "fill your boots". Martha Lane Fox was just a couple of months away from floating her tiny travel and tickets internet start-up lastminute.com at an outlandish price when the news came from across the Atlantic. "I was busy stuffing tickets into envelopes," she recalls. "Time Warner/AOL seemed a big deal - proof the world was irrevocably changed." Not quite right, she now concedes. In April that year, I travelled to AOL's headquarters in Virginia to interview Steve Case for Newsnight. The sprawling campus seemed rather staid and corporate for the funkiest company on the internet, and Mr Case's answers to my questions were all pretty bland - but there was little doubt that I was in the presence of the man in charge of changing the world. But from Virginia I flew on to Silicon Valley, and as I arrived all those day traders were looking at screens turning red. On April 14th, the Nasdaq index of hi-tech shares fell by 10%, leaving it 35% down from its peak a few weeks earlier in March. The bubble was bursting and over the next couple of years a lot of those young hopefuls who'd abandoned steady jobs or bet their house on the dotcom dream would have a rude awakening. The wheels did not fall off the AOL/Time Warner deal for quite a while. But gradually the tensions in the marriage between old and new media began to tell. 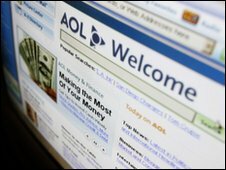 Neither company was quite what it seemed - AOL may have built a huge audience of internet users, but they were to prove fickle as the years went by. Time Warner had a great stable of old media brands but they were struggling to adapt to the online world - and a fading AOL was not the best route into digital homes. The idea of bringing together the people who supplied the internet with the owners of compelling content - the pipes and the poetry as the phrase went - seemed compelling in January 2000. But the companies that grew and prospered over the decade turned out to have a single-minded focus on the web as a means of communication, knowledge gathering and socialising. The brash young internet players found that it was more important to build a great platform which everyone would enjoy using than to own the content that would be distributed over it. It was meant to be the decade of AOL - instead, the noughties have seen the triumph of a company which has grown hugely powerful without getting into bed with old media. "This merger will launch the next internet revolution," said Steve Case at that press conference in 2000. But it turned out to be Google, not AOL, which changed the world. A crash or a 'correction'?